Birth is both a unique and universal experience. It is the one act in the play of life that demands a purity of will and undivided attention. For Sabrina Dorow, her birth demanded 26 hours of labor from her mother and 15 years of experience from nurse midwife Rene Smit to deliver her safely into the world. 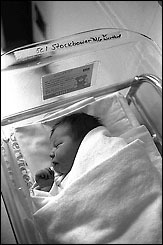 Weighing in at 8 pounds, 15 ounces, she was at once normal and unique.